Welcome to the internet home of The Ross Group! 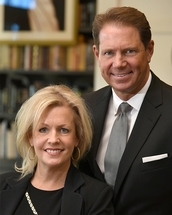 Libby & Craig Ross are ranked as some of the top luxury real estate agents in San Antonio, Texas and run The Ross Group of CBHarper Global Luxury REALTORS. Libby and Craig are deeply passionate about excellence and rank among the best in the world by creating exceptional experiences to the discerning and successful professionals they are so honored to serve as their clients every day. They also believe that being aligned with the most powerful luxury brokerage in the world with over $129.6 million luxury homes sold every day, over 88,000 affiliated agents in over 55 countries, Coldwell Banker Global Luxury gives their clients the cutting edge of luxury, cemented by over a century of innovation. The Ross Groupbelieves that finding, selling or building a custom luxury home should not be a guessing game or simply throwing darts at a board. How do you stir the senses and inspire the minds of the world's most discerning clients? Innovation, unconditional care and luxury reimagined! The Ross Group creates this experience and so much more in four very specific ways. #1 - The Ross Group steps into the shoes of their clients, actively listens for the true needs and desires of their clients and then uses statistically proven and proprietary systems along with exclusive technology and the powerful luxury home platform of Coldwell Banker Global Luxury to find that perfect home or to market and sell your home as quickly as possible for the absolute most money possible. #2 - The Coldwell Banker Global Luxury 360° marketing system offers an impressive stage to showcase your home that will literally explode your listing onto the world wide market. The Ross Group is borderless and comes armed with a complete suite of tools designed to share the beauty of your home with an affluent audience at all times, no matter where they happen to be in the world. Targeted print media and social media ads, digital suite, public relations, the finest HDR photography and videography are all just a part of the power of the Global Luxury marketing approach. The Ross Group also utilizes the power of the Coldwell Banker exclusive CBx technology which identifies and targets the right affluent clientele for your exceptional home. #3 - Libby and Craig provide weekly updates and reporting, verbal and in writing; consistent communication and constant availability; the highest level of follow-up and a commitment to step in and take control of every part of the process to give you the comfort and freedom to focus on your busy life. #4 - They operate & manage their real estate business like a Fortune 500 company which ensures that every detail is tracked, controlled and successfully handled to completely eliminate stress, and let you focus on your family, your business and the move. They believe so deeply about what they do differently, how successful they have been for their past clients and the unrivaled power of Coldwell Banker Global Luxury, the question is: What in the world would keep you from letting The Ross Group take care of you?